Et tu, Mr. Destructo? 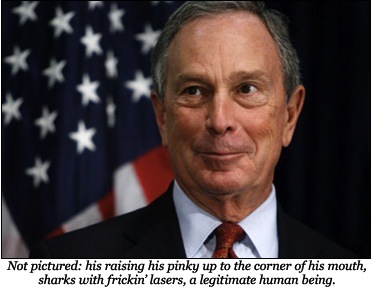 : Attaboy, Bloomberg! Apparently between appointments to explain to people that minorities and poor would-be homeowners tanked the American economy with billions of dollars of debt brought on by 40-1 leveraging, New York Mayor Michael Bloomberg decided to wipe the hippie smears off one of his parks. So long, for now, Occupy Wall Street. I'm sure Bloomberg thinks he has a plan, and I'm sure he's wrong. Bloomberg's office claimed that Zucotti Park had to be scoured of people and, with them, unsanitary elements that created a public health and fire hazard. Of course, all this potential epidemic and death lurked in the park before nightfall, before the eleven o'clock news, before people were at home asleep. They would also lurk tomorrow, in daylight, when people watch television or are on their way to work. Given the sophistication of the economic cleansing — subway lines and the Brooklyn Bridge shut down, a mobile infantry division of police and vans, helicopter support and airspace denied to news helicopters, press stripped of credentials and removed from the park — it's difficult to view it as anything other than suppression, both of coverage and of the Occupy Wall Street movement itself. The trouble with this kind of suppression is that it doesn't work very well, not unless you've got several divisions of Red Army tanks and no compunction about using them. When you think of mass suppression, you think of Budapest in 1956 and Prague in 1968, but Bloomberg doesn't have the luxuries of eliminating enemies from cities he doesn't have to live in, in satellite countries he controls at a distance. New York is real, and it has to go to work tomorrow. There's no time for a war; it's Tuesday. Besides, apart from the CIA, he doesn't have a secret police, and all the tut-tutting about allegedly promiscuous camping drug abusers will tend to get drowned out by the all the screaming from the mass executions. No, all that plutocratic shitsack Bloomberg has done is make people mad, and unlike his serial mendacity about his friends' recent track records with mortgage-backed securities, it's not likely he can convince anyone that Fannie Mae, Freddie Mac and the Community Reinvestment Act dispatched a private army to destroy these people's property, tear gas them and terrorize and scatter them into the streets. Now all these people will probably discard the rosy pretensions that the job of the police isn't to protect Bloomberg — and the higher stratum of Metropolis — from them at all costs. The removal of OWSers from the park should pose the question of what defines the movement aside from the tactic of occupying public spaces. It's a good question, one that addresses Augenbraun's concern that the movement lacked a greater political focus outside of a kind of lifestyle choice. But it's something that Bloomberg's actions — and events in Portland and Oakland — address far more starkly and urgently. If Occupy Wall Street's essential activity and function is gathering in public first and crafting strategy second and maybe doing something with that strategy third, then it remains extremely fragile. Dispersing it removes its primary function and primary means of making a socially compelling statement. If Michael Bloomberg has done anything today, it's emphasize that making people leave their Wall Street occupation can literally make Occupy Wall Street disappear. He's instructed these people he disdains as to their vulnerability. Had he left them alone, they might have pottered around in public for another month of polite dissension and political holiday, before growing bored, fatigued or hoarse from repeating themselves instead of a cohesive agenda. Everyone might have gone home and thought about applying to an MBA program. Instead, Bloomberg's reminded them of the strength of the opposition, the weakness of themselves and the impotency of their weapons, and he has confirmed how much they need to extend their reach beyond cities' public squares to harness the resources of those who can't join them in person. That was a stupid thing to do, but at least it's no longer in doubt who's playing Marie Antoinette in this production.